Mr. Kim carries the tradition set by some of the most recognized Taekwon-do masters in the world. He was especially fortunate to receive personal teachings from General Choi, Hong Hi — the acknowledged founder of modern-day Taekwon-do — and from Grandmaster Jung Tae Park, president of the Global Tae Kwon Do Federation. 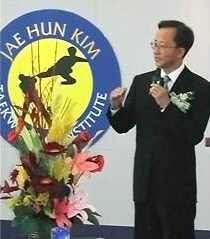 Mr. Kim received the rank of grandmaster in July, 1993 from the Kukkiwon world Taekwon-do headquarters in South Korea. Mr. J.H. Kim was born and raised in Korea. His father, Mr. Jwah Kyum Kim, was a military officer who later became a diplomat and a cabinet member in the Korean government. Mr. Kim’s father served as the head of the Economic Mission to Vietnam and as the first Korean Ambassador to Indonesia. He later returned to Korea and became a cabinet minister in charge of political affairs. Mr. Kim was exposed to martial arts at home at an early age. Not only was Mr. Kim’s father a Gumdo (sword arts) expert, he also had the influence of his uncle – a black belt in Taekwon-do – who lived in the Kim household. Studying martial arts became an even more important part of Mr. Kim’s life when his parents had to move to Vietnam, leaving their 11-year-old son behind in Korea. During that time, Mr. Kim practiced various martial arts, including Hapkido and boxing, but Taekwon-do remained the primary focus of his martial arts training. As a young martial arts practitioner, Mr. Kim was drawn to the effectiveness and aesthetically-pleasing qualities of Taekwon-do. While attending an all-boys high school (2,800 young men, all in one school), he became even further convinced of Taekwon-do’s efficacy as a form of self-defense. There was always a “sparring session” going on in some part of the school, so you can imagine why Mr. Kim appreciated the practical aspects of Taekwon-do. Mr. Kim moved to Winnipeg, Manitoba, Canada in 1967. There, he started his first Taekwon-do club while working hard as a full-time academic student. No one in Winnipeg knew what Taekwon-do was at the time, but those who witnessed it were impressed. The club flourished. Eventually, Mr. Kim invited a leading Taekwon-do Master, Mr. Jung Tae Park, to move to Winnipeg and open a school. Mr. Kim’s academic pursuits required much of his time, but when the new school opened, he continued to teach under Mr. Park, and also learned from him. Grand Master Park later founded the Global Tae Kwon Do Federation. Mr. Kim enjoyed and cherished every visit with General Choi. However, as General Choi became more and more politically involved with Eastern Bloc nations, Mr. Kim could not continue training with his teacher. Although Mr. Kim himself was not concerned about General Choi’s personal politics and had no feelings about them either way, maintaining close ties with him would have caused much difficulty for Mr. Kim’s father, who held a high-level position in the Korean government at the time. Mr. Kim had no choice but to leave his cherished teacher. However, the first thing that greets visitors and members at our school, to this day, is a set of beautiful calligraphy writings addressed to Mr. Kim by General Choi. Without the help and guidance of General Choi, Mr. Kim wandered for a while. But, it was not too long before Mr. Kim’s closest friend, Grand Master C.K. Ma, brought him into the United States Taekwondo Union (U.S.T.U.). With Mr. C.K. Ma and Mr. Yong Il Lee, Mr. Kim helped the organization’s president, Dr. Dong Ja Yang, to expand the U.S.T.U. into a national organization that officially represents Taekwon-do practitioners in the U.S.
Jae Hun Kim Mr. Kim’s experience outside of the martial arts circle is also quite interesting. He earned a B.S. degree from the Massachusetts Institute of Technology (MIT) and an MBA from Harvard Business School. He also served in the Korean Air Force, with the rank of Captain. In 1992, Mr. Kim decided to return to his first love – teaching Taekwon-do – on a full-time basis. He wanted to develop new instructors and to reach new communities, providing good instruction where more people could benefit from Taekwon-do training. The Jae Hun Kim Taekwon-do Institute now has more than 40 locations in the U.S., Singapore, Malaysia, China, Ireland, and Korea.